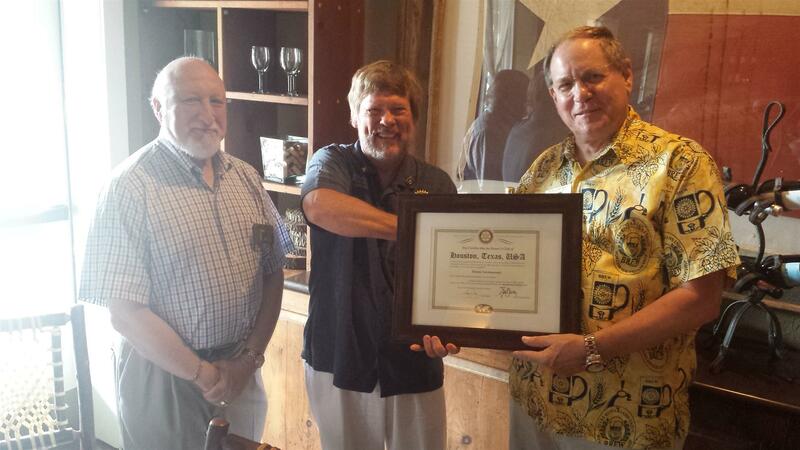 Welcome to the Rotary e-Club of Houston! Our club chartered on February 20, 2014 which coincided with the Rotary International President Ron Burton's visit to District 5890 and presentation at the All-Club Meeting. District Governor Bob Gebhard requested that Past District Governor Ed Charlesworth initiate this new format for club extension, and after reviewing the possibilities and visiting other e-clubs in the Rotary world, became excited to take on this challenge. The club chartered with 27 active members and within the first month added five more active members. The flexibility for those engaged in frequent business travel or those who simply had difficulties attending a traditional club on a weekly basis has brought many ex-members back to Rotary. This club also proudly states that three of the members are past Group Study Exchange team members or Rotary Alumni. One is a ROTEX, or past Rotary exchange student who stayed with three host families in the greater Houston are when in high school. We also have some who participated in Rotaract and Interact when younger. Our club is international with members located in Nicaragua, Ecuador, Bulgaria and The Netherlands. Rotarians who need makeup are always welcome, too! Please click to the link below and join us!